Impressive performance for its class. Narrow AF point coverage through viewfinder. 5.7 x 4.4 x 2.9 in. Below are crops from our laboratory Still Life target comparing the Canon 6D Mark II’s JPEG image quality to its predecessor’s, the 6D, as well as to the Canon 5D Mark III, since the latter camera is still available at time of writing for only about $300 more. We’ve also compared the 6D Mark II to its closest Nikon rival, the D750 which currently sells for $200 less than the 6D Mark II, the Pentax K-1 which sells for $100 less, and the Sony A7 II which sells for about $500 less. NOTE: These images are from best quality JPEGs straight out of the camera, at default settings including noise reduction and using the camera’s actual base ISO (not extended ISO settings). All cameras in this comparison were shot with our very sharp reference lenses. Clicking any crop will take you to a carrier page where you can click once again to access the full resolution image as delivered straight from the camera. For those interested in working with the RAW files involved: click these links to visit each camera’s respective sample image thumbnail page: Canon 6D Mark II, Canon 6D, Canon 5D Mark III, Nikon D750, Pentax K-1 and Sony A7 Mark II– links to the RAW files appear beneath those for the JPEG images, wherever we have them. 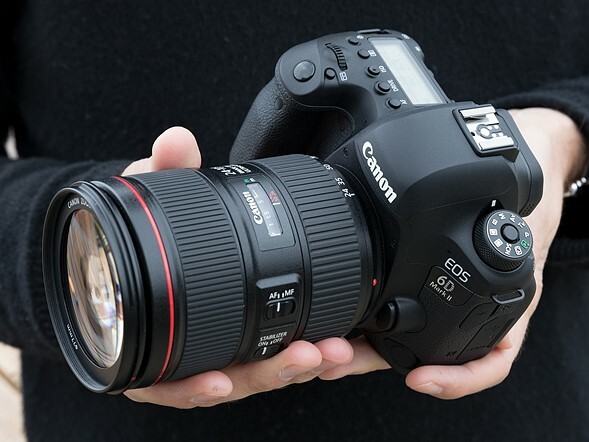 Above we compare the 26-megapixel Canon 6D Mark II to its aging predecessor, the 20-megapixel 6D. As you can see, the higher resolution 6D Mark II does resolve more detail and its image is also a bit crisper even though both cameras generate unsightly sharpening halos around high contrast edges at default settings. (The 6D Mark II does however support Canon’s Fine Detail Picture Style which lets you adjust sharpening strength, radius and threshold,while the 6D does not.) The 6D Mark II’s rendering of our tricky red-leaf swatch shows lower contrast, but fine detail is actually better as the 6D II was able to resolve some of the individual threads that the 6D does not. There are also moiré patterns interfering with the leaf pattern from the 6D II, an indication its optical low-pass filter is perhaps not as strong as the 6D’s. Both cameras produce excellent color, though the 6D is slightly cooler. 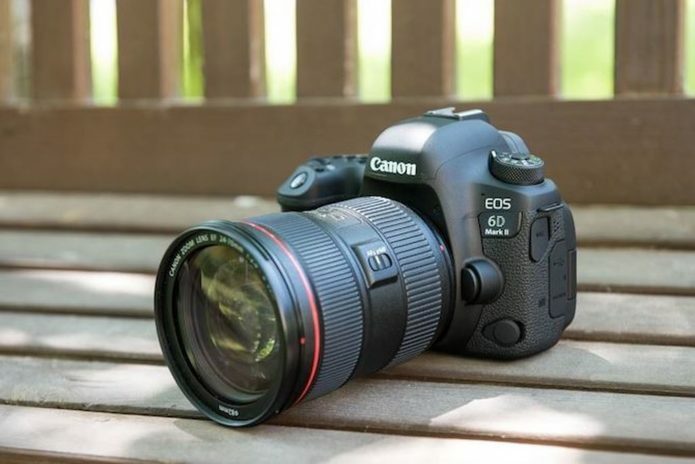 Here we decided to compare the 6D Mark II to the 22-megapixel 5D Mark III, as the latter is pretty close to the 6D II in price now that the much more expensive 5D Mark IV has superceded it. The comparison is similar to that with the 6D, with the 6D Mark II resolving a bit more detail, while the 5D Mark III does a better job with rendering our troublesome red-leaf fabric even though it can’t resolve any of the individual threads. Again, no obvious moiré patterns from the 5D III in the fabric and overall color is slightly cooler than the 6D Mark II’s. 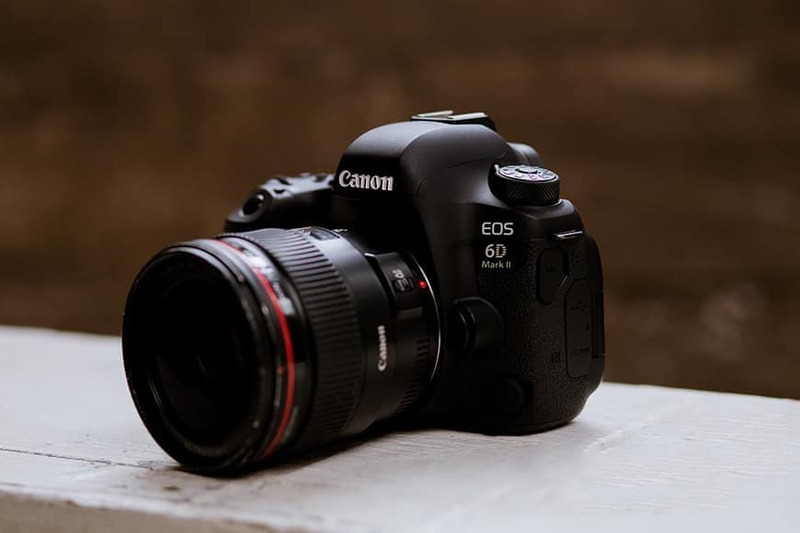 Above we compare the Canon 6D Mark II to the 24-megapixel Nikon D750, perhaps its closest rival given they have the same list price and similar specs (although as of this writing the street price for the D750 body is currently $200 less). Here at base ISO we can see the two cameras resolve very similar levels of detail with the slightly higher pixel count of the Canon offset somewhat by the Nikon’s lack of an optical low-pass filter. The Nikon image is a little sharper yet with slightly less obvious sharpening halos, however moiré patterns are even stronger from the D750 in the red-leaf fabric. Interestingly, contrast is generally a little higher from the Canon giving its image a bit more “pop”, despite lower contrast in the red-leaf swatch. Looking very closely, noise appears a little higher from the Nikon in flatter areas however noise in deep shadows is higher from the Canon. Both cameras produce pleasing color, but colors are slightly more accurate from the Canon. Here we compare the Canon 6D Mark II to the 36-megapixel Pentax K-1, the latter company’s only full-frame DSLR as of this writing. This comparison may seem unfair given the roughly 10-megapixel resolution advantage the K-1 has, however it’s currently selling for about $100 lessthan the 6D Mark II, putting it in direct competition for those not needing the more advanced video and performance from the 6D Mark II, or native EF lens compatibility. As you can see, the K-1 easily outresolves the 6D II as expected, although noise levels are higher from the Pentax. The K-1 image is also crisper with slightly lower sharpening artifacts as well. Moiré is also visible from the K-1 in the red-leaf swatch, however keep in mind it has an on-demand AA-filter Simulator which was disabled for this shot. Default saturation is much higher from the Pentax, however color is much more accurate from the Canon. Above we compare the Canon 6D Mark II DSLR to the 24-megpapixel Sony A7 Mark II mirrorless camera, the closest current generation Sony full-frame camera in terms of price and resolution (the 42-megapixel A7R II and A99 II are both significantly more expensive than the 6D II at about $700 and $1,200 more respectively). Here we can see the Sony A7 II resolves similar levels of detail with comparable noise levels, however Sony’s sharpening is much more advanced producing a much crisper image with less noticeable sharpening halos. Contrast in our red-leaf swatch is much better from the Sony with less pattern break up from individual threads, however moiré patterns are more evident suggesting a weaker optical low-pass filter. Colors are a little more pumped from the Sony, however they are generally more accurate from the Canon. Here at ISO 1600, we can see the 6D Mark II manages to resolve a bit more detail with similar noise levels while at the same time backing off on sharpening a bit more, however the 6D does much better rendering subtle detail in our tricky red-leaf swatch. The 6D Mark II’s rendition has much lower contrast, and some of the fine detail is broken up by the thread pattern as well as moiré. The newer camera does better in the pink fabric, though, and overall the 6D II offers a nice improvement over its predecessor given its higher resolution. It’s a similar story here against the 5D Mark III, however the older camera has not backed off as much on sharpening as the 6D Mark II, making its images a bit crisper but with more noticeable sharpening halos around high contrast edges. Again, the older camera does better with our troublesome red-leaf swatch, but it’s a pretty close race here at ISO 1600 overall. Above at ISO 1600, the Canon actually produces slightly higher contrast giving the impression of better detail, however the Nikon actually holds onto a little more fine detail despite looking a bit softer in the mosaic crop. Luminance noise is higher from the Nikon, though. Both cameras start to blur our tricky red-leaf swatch however the Nikon holds onto more of the fine thread pattern, while both show some moiré patterns. Colors are generally more saturated from the Nikon (except reds and yellows), however the Canon’s color is more accurate overall. The Pentax K-1 continues to capture significantly more detail here at ISO 1600, except in our red-leaf swatch which it blurs much more heavily than the 6D II. Noise is however noticeably higher from the Pentax as well, and the Canon continues to deliver much better color. The Sony A7 II’s image remains much crisper here at ISO 1600, while still containing only minor sharpening halos that have a smaller radius than the ones generated by the Canon. Fine detail is better from the Sony as well, despite the slightly lower resolution. Noise levels are similar, however the Canon’s noise “grain” looks a little more consistent and natural than the Sony’s. Color continues to be better from the Canon. It’s a pretty close race here at ISO 3200 at the pixel level, with the 6D Mark II capturing a touch more detail (except in the red-leaf fabric), with slightly lower noise levels and less haloing along high contrast edges. The 6D however does much better with our challenging red-leaf swatch, but again, overall we give the edge to the 6D Mark II for being able to increase resolution while keeping noise in check. The 5D Mark III image has higher contrast and appears a bit crisper, however stronger sharpening halos indicate more aggressive processing. Noise levels appear lower from the 6D Mark II, but once again the older camera does much better in our red-leaf swatch. Similar to what we saw at ISO 1600, the Canon 6D Mark II’s higher contrast and slightly more aggressive processing yield crisper results in our mosaic crop. However the Nikon retains a bit more detail and produces fewer noise reduction artifacts, although luma noise is much higher from the D750 in flatter areas. Subtle detail is better from the Nikon in our red-leaf swatch, but both cameras blur it pretty heavily now. Colors are still a bit warmer and more pleasing from the Canon. It’s a close call, but overall, we’ll give the Canon the nod here. The K-1 still captures noticeably more detail with fewer noise reduction artifacts than the 6D II except in our red-leaf swatch which has almost no detail left from the Pentax here at ISO 3200. Luma noise is much higher from the Pentax, and colors are still much more accurate from the Canon. The Sony A7 II continues to produce a sharper, crisper image with better detail than the Canon, however noise is a bit higher in flatter areas, and the noise “grain” is not as consistent giving the Sony image a slightly more processed look. Color is still more accurate and pleasing from the Canon but overall the Sony comes out ahead here. Detail comparison. High-contrast detail is also important, pushing the camera in different ways, so we like to look at it separately here. As you can see, the Canon 6D Mark II does capture more detail with better contrast than its predecessor, even as ISO climbs. This is also true compared to the 5D Mark III, although the improvement isn’t quite as much. Interestingly, the Canon 6D Mark II compares quite nicely to the Nikon D750, besting it at all three ISOs. The Pentax K-1 shows better detail as expected, however contrast and sharpness lag behind here. The Sony A7 II comes out ahead overall in this group with excellent sharpness, less obvious sharpening halos, good contrast and almost no loss in image quality as ISO climbs within this range.